I have a small stash of vintage pillowcases with cheery prints, just like the ones my grandma's beds used to have. I'm sure when it was time to recycle, she made her daughters pyjamas. How sweet are these little birds? This pillowcase had a pinkish hue to it (I'll bet somebody's grandpa did the laundry and threw in the reds with the whites). There was just enough fabric to make a long top for a three year old. I paired it with some pink linen to make bloomers and finished them with pillowcase bias tape. We still have mounds of snow here, but if summer ever makes an appearance, Little V can sleep tight in these. Check out my friend Melissa's blog Until Wednesday Calls today. 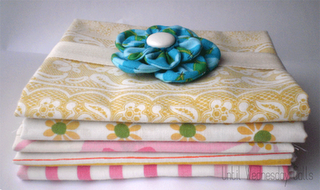 Melissa is giving away this beautiful fat quarter vintage sheet bundle in conjunction with the Vintage Sheet Blog. These are adorable!! love the bloomers. They are so cute! I love the vintage fabrics! Vintage sheets and pillowcases are so much softer than the sheets we have these days! Perfect for comfy pajamas. Love it! Also, I love your new sidebar. Nicely done! Oh how I love these! I too have used a number of vintage sheets and pillow cases to make pj's for my kids but none as adorable as these! You have inspired me as it's that time again. Everyone has grown and new pj's are needed for all. I still have a few cute sheets from yesteryear in my stash (no cute birdies though:( Thank you for this wonderful post!